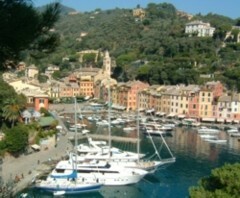 Find and book hotels in Liguria. With location maps and guest reviews. The region of Liguria is a slender strip of land at the top of Italy's boot, curving north-westwards around the Mediterranean, stretching from Tuscany to the French border. This area is often known as the 'Italian Riviera' and its seaside resorts and elegant promenades have attracted sun-hungry northern Europeans for more than a century. The generally rocky coastline rises up to inland mountains which are increasingly steep and high towards the north-west where the Maritime Alps (reaching up to over 2,600m in height) meet the sea. This geography has created a famously mild climate benefiting both tourism and the region's renowned gardens. The only major city in Liguria, located right in the middle of its coastline, is the historic port of Genoa, once one of the Mediterranean's great powers. The coast to the west of Genoa, dotted with resorts like Sanremo, is known as the western riviera, the Riviera di Ponente. In the other direction, heading southwards to Tuscany, the coast is called the Riviera di Levante, and encompasses the cliffside villages of the Cinque Terre, and the posh harbour Portofino. The Ligura region is divided into four provinces: Genova (Genoa), Imperia, La Spezia and Savona. Ligurian food is filling and delicious. The flower-growing region is also famous for its edible produce: olives, peaches, asparagus, artichokes and tomatoes; speciality dishes include pesto - with pasta or even on pizza - and products based on potatoes and chickpeas. Specially recommended is farinata, a tasty snack which is made from chickpeas and which is delicious eaten hot in a takeaway. The most convenient budget airports for Liguria are Genoa, Pisa and Nice (a short train trip into France). Good train services run all along the curving coastline, and buses connect the smaller destinations. Although it's quite straightforward to explore Liguria using public transport, touring by car is a good alternative for those wanting to see the entire region. Leisurely progress along the coast makes for an elegant and pleasant vacation. 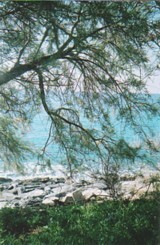 Different types of holiday can be enjoyed in Liguria. As a city destination, Genoa has a lot to offer: historic palazzi and fascinating museums. On the Riviera, closest to France, Sanremo and Bordighera can be combined well with trips into France and Monaco; there are excellent train and bus connections linking the French Riviera with the Italian Riviera. 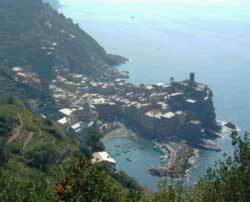 And all along the Ligurian coast, trips inland will take you to hillside villages, wooded mountains and even winter skiing destinations. South of busy Genoa, the coast winds through some of Italy's prettiest scenery. Portofino, a tiny harbour town famed for its elegance, sits at the tip of a large promontory; just to the south, Santa Margherita Ligure is a larger, stately resort where palms wave along the esplanade. The coastal route south touches other popular resorts - Rapallo, Sestri Levante - before reaching the famed mountainous coastline of the Cinque Terre. These are five picturesque fishing villages set along the beautiful steep coastline, with plenty of good walks which attract crowds of energetic tourists. Just a little further south, Porto Venere on its rocky headland marks the beginning of the huge coastal indent, the Golfo dei Poeti, haunt of Byron and the Shelleys. The area's largest town, La Spezia, sits across the inside of the bay, on the southern side prettier towns include Lerici (where the Shelleys lived) and San Terenzio. If you fancy a holiday spread over two, or even three, countries, consider either a several-base holiday, or day trips west of San Remo into France or Monaco. Extra Virgin by Annie Hawes is a funny and warm account of the English writer's experiences as she settles into a small hillside village in Liguria, and learns about local customs, personalities and olive-growing. The excellent Cadogan series includes this guidebook to the Italian Riviera. Their books are always instructive and entertaining.